1John 2:15-17 Love not the world, neither the things that are in the world. If any man love the world, the love of the Father is not in him. For all that is in the world, the lust of the flesh, and the lust of the eyes, and the pride of life, is not of the Father, but is of the world. And the world passeth away, and the lust thereof: but he that doeth the will of God abideth for ever. 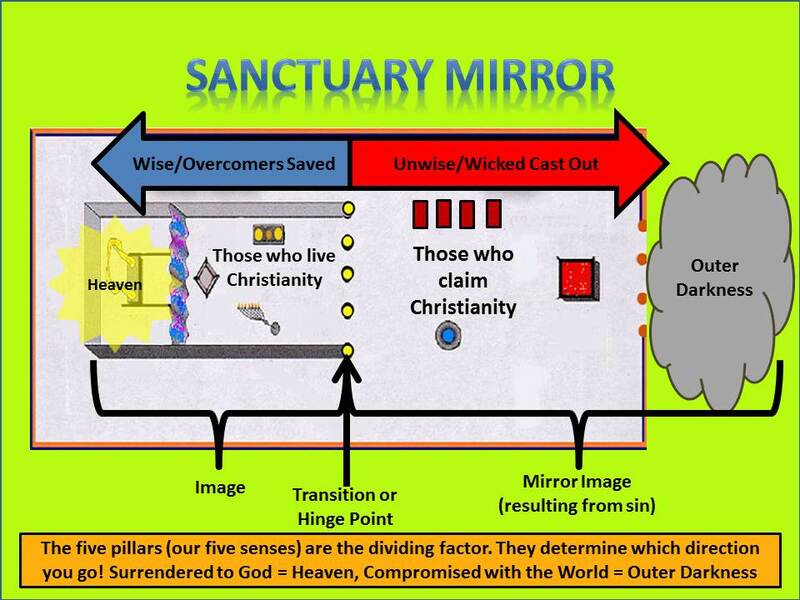 The sanctuary reveals the dividing line between those who are true followers of Christ and those who claim to be following Christ, that "have a form of godliness - but deny the power thereof"
Notice first the mirror. 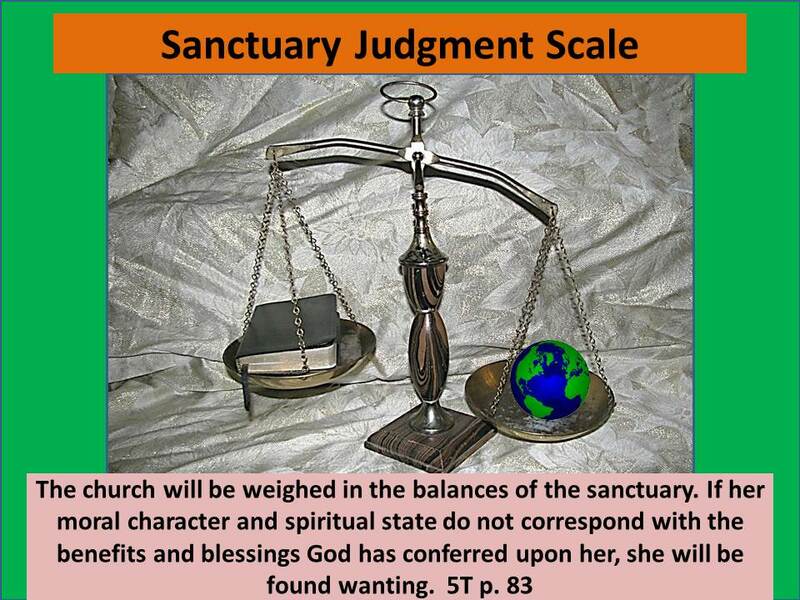 There is a square altar of incense and a square altar of burnt offering. There is a table of shewbread and tables for killing the sacrifice. There is a lamp stand for which no measurements are given and a laver for which no measurements are given. 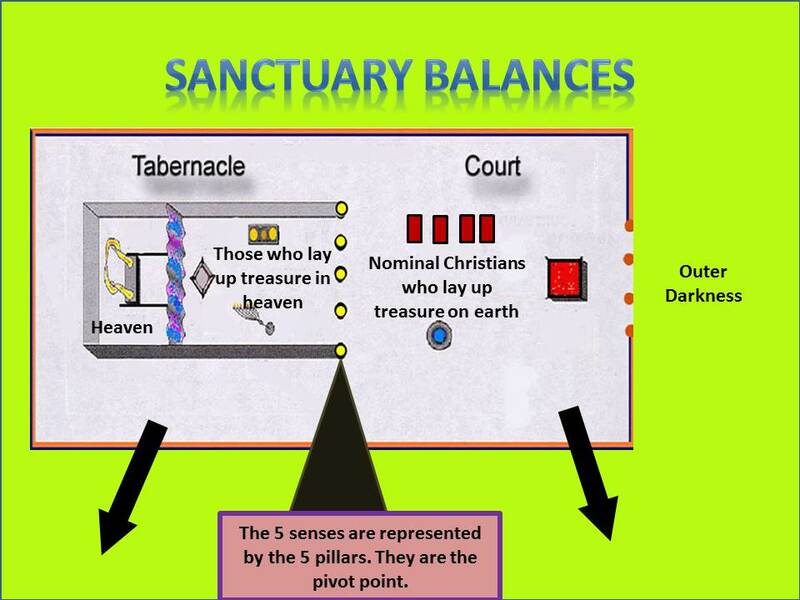 The five pillars are halfway in the tabernacle (gold pillars, the metal of the tabernacle/heaven) and halfway in the world (brass sockets, the metal of the court/world). Here you have the 10 virgins of Matthew 25. Five are wise/those who live Christianity, and five are foolish/those who claim Christianity but deny the power thereof. Mat 22:11-14 And when the king came in to see the guests, he saw there a man which had not on a wedding garment: And he saith unto him, Friend, how camest thou in hither not having a wedding garment? And he was speechless. Then said the king to the servants, Bind him hand and foot, and take him away, and cast him into outer darkness; there shall be weeping and gnashing of teeth. For many are called, but few are chosen. Jesus freely offers his robe of righteousness, (the white border around the court and tabernacle to everyone), but we must choose to wear it, by being changed into his image (the process of sanctification)We must guard our senses because we become like what we behold. 2Ti 3:1-5 This know also, that in the last days perilous times shall come. For men shall be lovers of their own selves, covetous, boasters, proud, blasphemers, disobedient to parents, unthankful, unholy, Without natural affection, trucebreakers, false accusers, incontinent, fierce, despisers of those that are good, Traitors, heady, highminded, lovers of pleasures more than lovers of God; Having a form of godliness, but denying the power thereof: from such turn away. The choice is ours, we can choose to use the garment and oil that have been freely given to us by God or we can choose to do things our own way. We can choose to respond to the urgent message that the bridegroom, Jesus, is coming again, or we can procrastinate until it is too late. 2Co 6:2 ...Behold, now is the accepted time; behold, now is the day of salvation. Matthew 25:13 Watch therefore, for ye know neither the day nor the hour wherein the Son of man cometh!